Horse Grooming Tools and what you should use for grooming a horse. There are several tools that are commonly used when grooming a horse. Acquiring a full set of the proper grooming tools and learning the proper techniques, will help to make sure your horse remains comfortable and enjoys the grooming process. Grooming a horse is also an important part of the bonding process and will help you both to become a true pairing and to build a bond of trust in each other. The horse is rubbed or curried in a circular motion, which helps to loosen dirt, hair, and other detritus, plus stimulate the horses skin to produce natural oils. The curry comb is usually used in a circular motion to work loose embedded material. Curries are generally too harsh to be used on the legs or head, though varieties made of softer rubber are available. Is made of metal with a fixed handle. They are designed for use on show cattle. There is no reason for a horse owner to buy one. However, some barns have them sitting around and use them for cleaning out softer-bristled brushes. But, for removing mud and winter hair, as well as for cleaning brushes, a shedding blade is preferable to a metal curry, and a shedding blade can also double as a cleaning tool for other brushes. A stiff-bristled brush is used to remove the dirt, hair and other material stirred up by the curry comb. Brushes are used in the direction of the horse’s hair coat growth, usually in short strokes from front to back, except at the flanks, where the hair grows in a different pattern. The best quality dandy brushes are made of stiff natural bristles such as rice stems, though they wear out quickly. Plastic-bristled dandy brushes are more common. 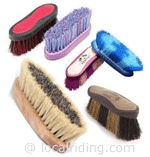 Dandy brushes can usually be used on the legs, but many horses object to a stiff brush being used on the head. Some dandy brushes do double duty as a *Water Brush, dampened in water and used to wet down the mane and tail. A soft-bristled brush removes finer particles and dust, adds a shine to the coat and is soothing to the horse. A body brush can be used on the head, being careful to avoid the horse’s eyes. Some natural body brushes are made of boar bristles, like human hairbrushes, others are made of soft synthetic fibers. The body brush is always the last brush used on the horse. A terrycloth towel or other type of cloth can be used to give a final polish to a horse’s coat and is also used after riding to help remove sweat. Horses with short, pulled manes have their manes combed with a wide-toothed plastic or metal comb. Horse tails and long manes are brushed with either a dandy brush or a suitable human hairbrush. Most agree that it is best pick out the tail, and long manes, by hand. The mane comb is also used when pulling the mane. A hooked tool, usually of metal, used to clean the hooves of a horse. Some designs include a small, very stiff brush for removing additional mud or dirt. All four feet of the horse need to be cleaned out before riding. They come in a variety of shapes and sizes. In special weather conditions, a metal shedding blade with short, dull teeth is used to remove loose winter hair. 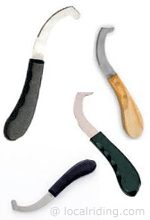 A shedding blade is also useful for removing caked-on mud. However, grooming tools with metal teeth can split and dull the horse’s hair coat and may irritate the skin, so must be used with appropriate care. 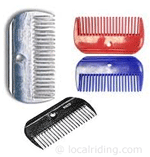 Likewise, metal grooming tools used on sheep and show cattle may also be too harsh to use on a horse. In the summer, fly spray is often applied to the horse after grooming. Care must be taken to avoid the eyes and mucus membranes. used to remove bottfly eggs from the horse, which are usually laid on the legs or shoulder. Bot eggs are yellow and roughly the size of a grain of sand, they are clearly visible on dark hair, harder to spot on white hair. A small pumice stone is also commonly used for the same purpose. Sometimes, though not always, horses are clipped with scissors or electric clippers, to remove or shorten unwanted hair. 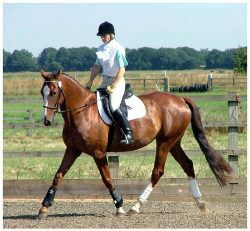 There are various types of clip used, based on the work your horse will be doing and clipping usually occurs at the start of the hunt season. Small sponges can be used to clean the nose, lips and dock, larger sponges can be used to wet down and clean the body and legs.